Becky Bowley will take the train from Sheffield to Manchester. In Sheffield she will dig a hole and take the earth to the next stop, Grindleford, where she will then dig another hole and fill that hole with the earth from Sheffield, she will then take the earth from Grindleford to Hathersage, where she will then dig another hole, and fill that hole with the earth from Grindleford, and this process will continue along the hope valley line until she reaches Manchester and then goes back to Sheffield to fill the original hole with the earth from Manchester. Transmerge is a ritual that communicates an artistic desire to merge body and land for creative peaceful purposes without boundaries of ownership. Prehistorically land and rock art may have been used to define boundaries, and ownership of the land to certain ‘tribes’ and to indicate their beliefs and rituals. These boundaries of land and people continue today causing global and personal conflict between individuals. Land and people are separated by differences that can be transformed into a merger of unique parts at peace with each other, which is ritualised in the performance of Transmerge. The performance will be two days long and take place on the 21st and 22nd of June, Becky will work closely with arts photographer Julian Hughes to document the performance. 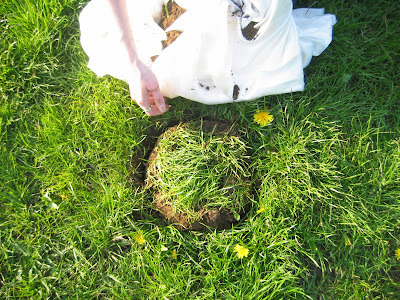 The photographs will be exhibited alongside a diary of the process and mapping of exchanged earth holes at http://beckybowley.blogspot.com/ where details of times, and stops will follow shortly.